During September 2003, a survey was conducted in Amazya Forest (Permit No. A-3974, map ref. 190000–921/601400–2520), prior to replanting the forest at Horbat Hazzan and its environs. The survey, undertaken on behalf of the Israel Antiquities Authority and underwritten by the Jewish National Fund, was performed by P. Nahshoni and Y. Lender, with the assistance of S. Gal (map). The survey (c. 1,000 dunams) was carried out along the eastern fringes of Amazya Forest, between Nahal Adorayim in the south and Horbat Hazzan to the north. The region had been surveyed in the past by Y. Dagan (2006. Map of Amazya , Volume 2, the Southern Sector). Forty-five sites were documented in the current survey, including building remains (12, 13, 20, 26–29), remains of the Khirbat Hazzāna village, dating to the Ottoman period and the British Mandate era, including a mosque (31), remains of a building (36), a courtyard (22) and an animal pen (32). Other documented features included a large stone heap (6; diam. c. 10 m), farming terrace walls (1–5, 24–26, 29, 38, 39), underground cavities and caves (7, 8, 11, 15, 19–22, 33–35, 37, 40–42, 44), cisterns (8, 14, 18, 30, 45), bell-shaped caves (10, 16, 27–29, 43) and columbarium caves (9, 23). 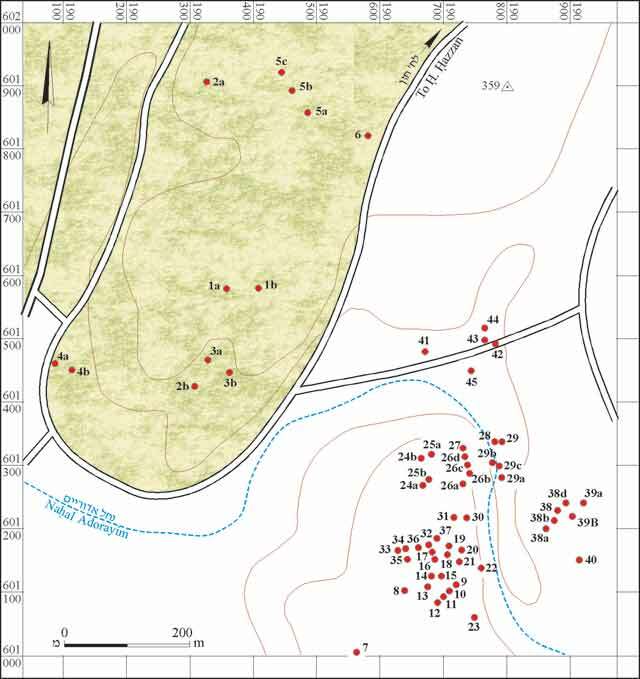 Signs of illicit diggings were detected at no less than four sites (17, 20, 42, 44). Potsherds dating to the Hellenistic, Early Roman, Byzantine, Early Islamic and Ottoman periods, as well as the British Mandate era, were collected. It seems that a settlement dating to these periods existed in the vicinity and was based on agriculture, as evidenced by the farming terrace walls and the columbaria.